During the past week, I've been quite the busy professional, traveling from New York to Louisville (pronounced "Loo-uh-vl," as I soon learned) and back again. It's always good – and helpful – to get out in the world and leave my computer screen behind. Even an editorial director (me!) 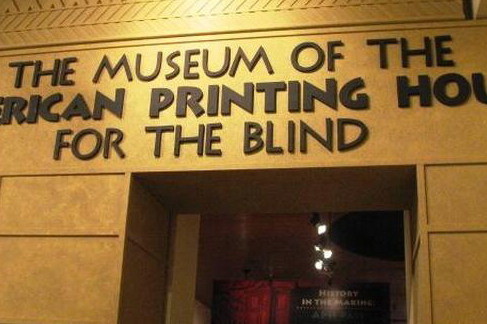 cannot live by words alone. The business portion of my trip involved my commitments as a member of the Board of Directors of the Academy for Certification of Vision Rehabilitation and Education Professionals (ACVREP). 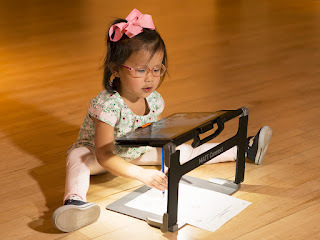 The Academy is dedicated to providing high-quality professional certification in the professional disciplines of low vision therapy, orientation and mobility, and vision rehabilitation therapy. This particular Board meeting was special, however, because it was held at the American Printing House for the Blind (APH) in Louisville, Kentucky, the home of bourbon, the Kentucky Derby, and the Louisville Slugger bat. 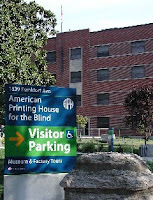 APH is the world's largest nonprofit organization that specializes in creating educational, workplace, and independent living products and services for people who are blind or visually impaired, including accessible books and magazines in braille, large print, recorded, and computer file formats; educational products; independent living products; production of custom accessible media, such as braille menus; and product training seminars. I think very highly of APH's mission, services and longevity, and I was thrilled to be there. You can learn more about APH's long and storied history at the APH web site. And of course I brought my camera to document my favorite parts of APH. The Hall of Fame for Leaders and Legends of the Blindness Field honors, at present, 46 individuals who were pioneers in the blindness field and shaped the field's history, philosophy, knowledge, and skills, while providing outstanding service to people who were blind and visually impaired. I was in awe as I read the biographies of Dr. Natalie Barraga, whose eloquent writings first drew me into the field; Dr. Douglas Inkster, who gave me my first job; Father Thomas Carroll, whose words still inspire me; and Dr. Ruth Kaarlela, the founder of my profession. And what trip to APH would be complete without stopping in to visit with Michael McCarty, the talented web master of Fred's Head blog? Under Michael's expert stewardship, the blog contains tips, techniques, tutorials, in-depth articles, and resources for and by blind or visually impaired people. Great to finally meet you, Michael! 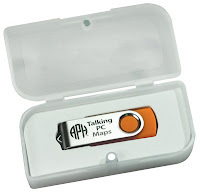 I also learned more about an exciting new navigational product from APH and the Sendero Group, called Talking PC Maps. 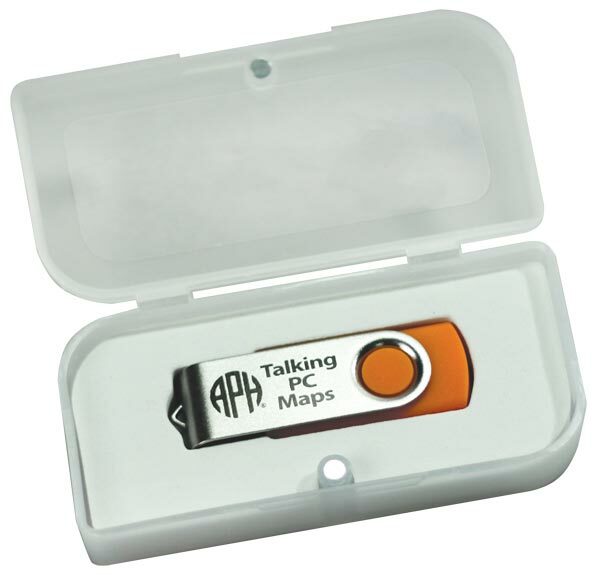 The PC Maps software works on any computer and provides spoken and on-screen map data and 12 million points of interest for U.S. states, territories, and Canada on one flash drive. I thank Dr. Tuck Tinsley III, President of APH, for his generosity in providing meeting space, expert guides, staff support, wonderful food, and personalized braille bourbon labels for our ACVREP President Garett A. Holm - an excellent use of functional braille, wouldn't you agree? I also urge our readers to become acquainted with APH's high-quality and innovative products and services for adults and children who are blind or visually impaired. I highly recommend Dr. Tinsley's fine organization. By: Maureen A. Duffy, M.S., CVRT, Editorial Director of AWARE. Maureen is an editor, writer, and adjunct faculty member who contributes numerous books, book chapters, and articles in a variety of professional and academic publications on blindness, vision loss, and aging.